There’s something special about watching the chefs at Midtown Creperie ladle their batter onto a perfectly circular griddle, spreading it out with expert precision. The batter bubbles and steams until it’s flipped over, creating a homemade crepe, a paper-thin pancake, which can then be stuffed with anything and folded into a warm treat that’s satisfying for any meal of the day. When it comes to dessert, the Dixieland Crepe has a reputation. 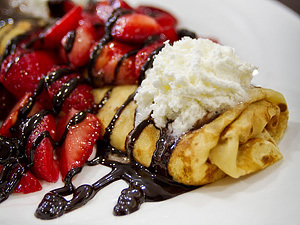 Stuffed with a smooth mixture of cream and powdered sugar, the crepe is rolled up and then generously drizzled with ripe, red strawberries, warm, dark Ghirardelli chocolate and fluffy whipped cream. Chocolate and strawberries have long been a favored combination, but with the addition of a warm buttery crepe and the creamy filling that’s not overly sweet, it’s satisfying to the point of perfection. Perhaps the magic comes from combining so many dessert elements: buttery crepe, decadent chocolate, juicy strawberries, creamy filling-it’s like four desserts in one. What more could you want?